The year I went to Horticulture school in Vancouver was unusually warm at Canadian Thanks Giving time and i went home on the train for the long weekend. While I was there I saw that someone had harvested the vegetables which I had planted in the small garden which I had kept. There was zucchini, tomatoes, peppers and cabbage there on the back porch when I got home. During the weekend I decided to walk around the neighborhood and see the gardens with my newly educated eyes and brain. To my surprise I saw some culinary Sage (Salvia officinalis) growing in a back garden. I decided as soon as I could I would give my mom a Sage plant to grow and use in her delicious turkey stuffing. She was so thrilled when she could use fresh Sage the following year. 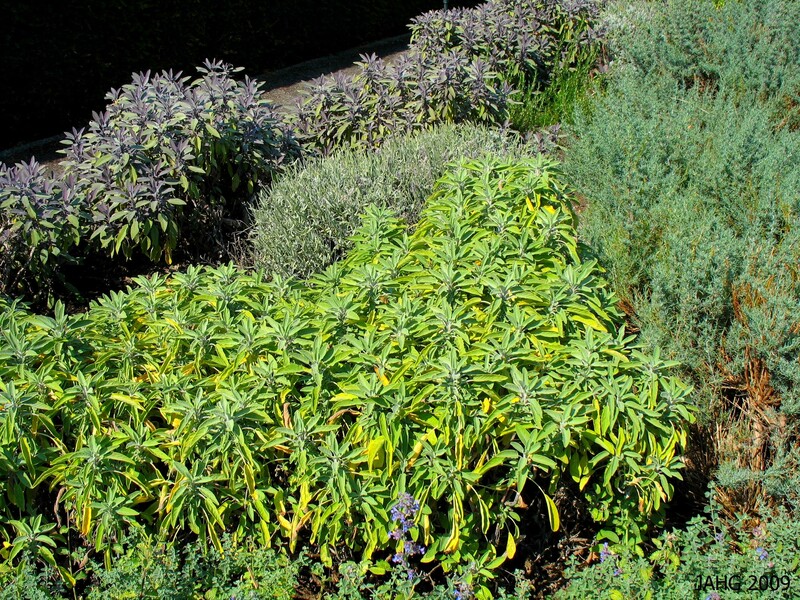 Two forms of Savia officinalis are seen here, Dwarf and Purple leaved. Sage has long seen as a valuable plant, it’s Latin name ‘Salvia’ means to heal. During the centuries past it has been used in many medicinal ways. It’s best known property is being used to reduce perspiration, this is useful for those persons dealing with night sweats. It is also well known as an astringent which has commonly been used as a gargle for tonsillitis, laryngitis and sore throats. 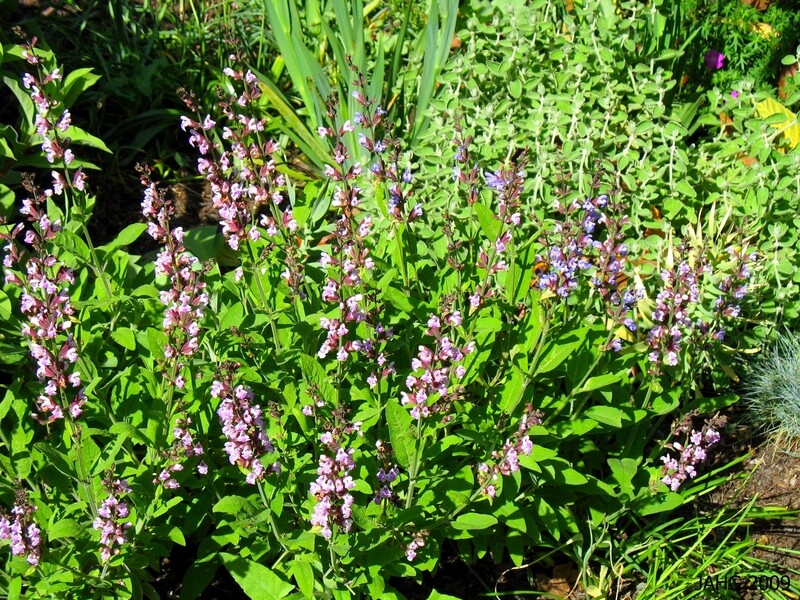 Salvia tea in the past was also prescribed for problems such as nervous conditions, trembling, depression and vertigo. Crushed fresh leaves are used help relieve insect bites. Salvia officinalis 'Rosea' is one flower color variation which makes an attractive addition to a garden. Sage also has other qualities which were seen to be more important in the past. It was believed to help ward off evil spirits. The quality whhich is most important today is that of it’s ability to flavor savory dishes. The most traditional use at this time of the year is related to it’s use in the Christmas Turkey. 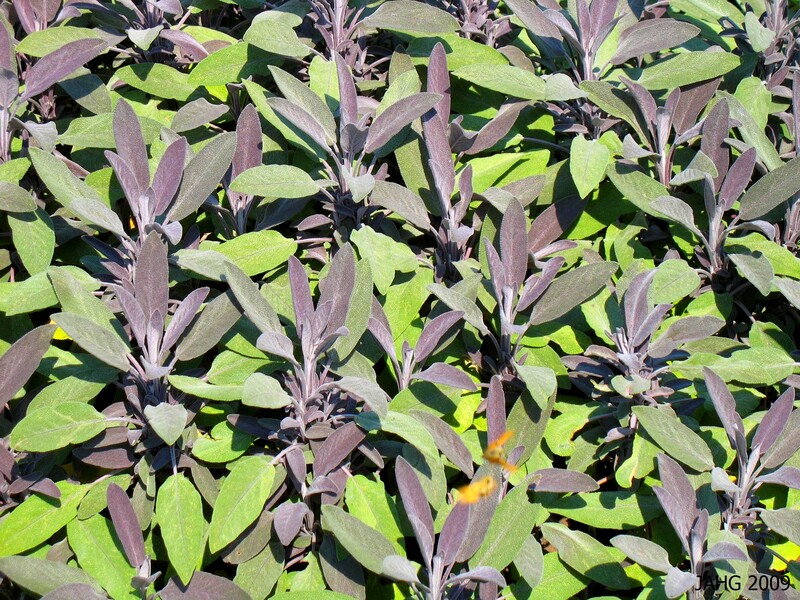 Sage imparts a peppery earthy flavor which adds depth to many dishes. It can be used fresh or dried and it often blended with other herbs. It often is used with fatty meats such as duck, goose or pork. Salvia officinalis 'Icterina' is also known as Golden Sage and is one of the brightest shrubs in the garden. Savia officinalis is a low shrub which is evergreen, the leaves are unusual in that they are highly aromatic. There is now a fair selection of color forms ranging from the dusky purple of ‘Purpurascens‘ through the traditional ‘sage green’ through to almost yellow forms such as ‘Icertina’ and ‘Aurea’. There are also an attractive wider leaved form called ‘Berggarten’ and a narrow type ‘Lavandulaefolia’. ‘Tricolor’ is a weaker growing form which blends green, white and purple and commonly reverts to green. ‘Alba’ has the grayest foliage and produces attractive white flowers. 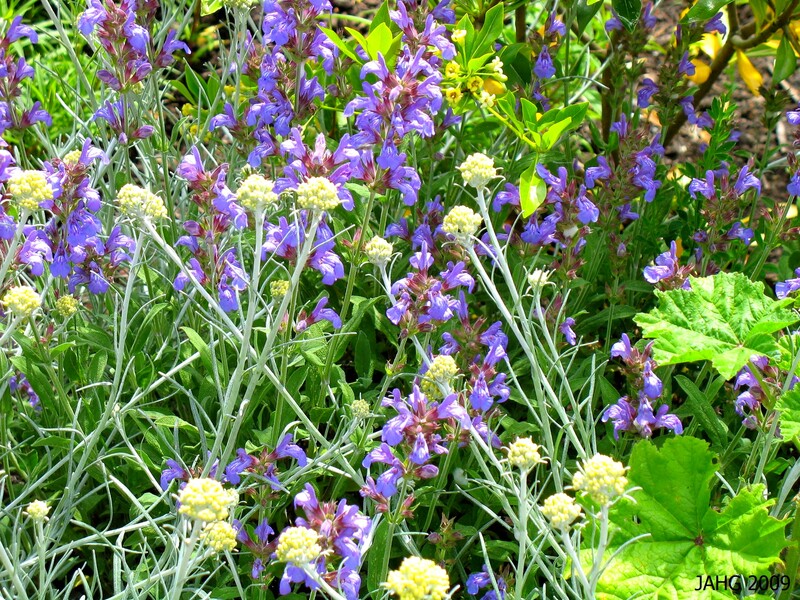 Salvia officinalis 'Purpascens' is probably the most attractive and vigorous form of Sage to grow. Sage is a member of the labiatae (mint) family and has the characteristic square stems and lipped flowers. It is quite hardy for a herb and tolerates zone 4 -30f(-34c). Salvia officinalis grows to about 2ft(60cm) tall and slightly wider. The one thing which it dislikes is winter wet especially if the soil is poorly drained. 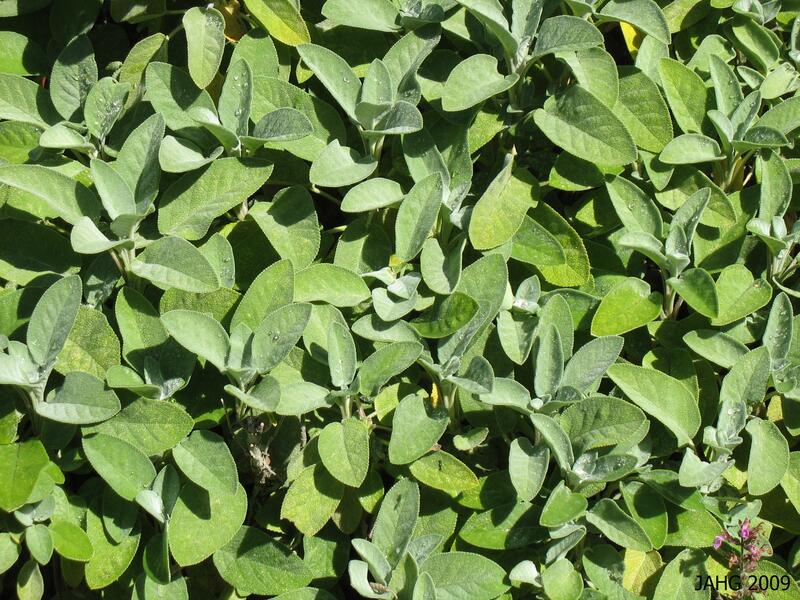 Sage is best grown in full sun and sharply draining soil that is average in nutrient content. Prune back after flowering. 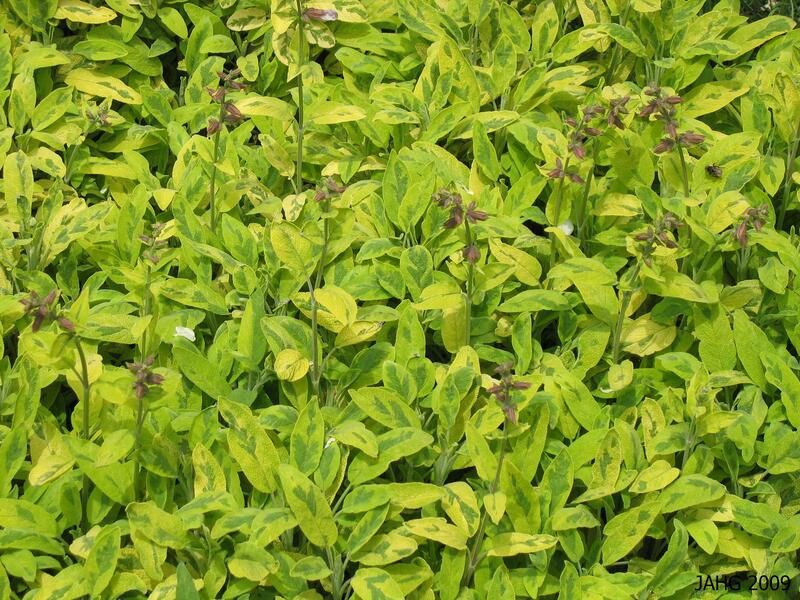 It is a very versatile plant which grows well in many situations such as perennial borders, herb gardens, shrub borders, rock gardens, container plantings and in areas of low watering or in sites which are not easily watered. You can also plant in places where the foliage will be rubbed to give off its scent. Sage is also a butterfly and bee attractant. Salvia officinalis 'Berggarten' has slightly broader leaves than other Sages. Pests do not bother Sage. One disease (Verticillium dahliae) called Verticillium or Sage Wilt will kill the plant. It is important if you have this problem not to replant any Sage in the same place again. When selecting a plant to buy choose the most vigorous plant with the best coloring in the leaves as it can vary. Most forms are now produced by cuttings which easily root. You can grow the plain Salvia officinalis from seed but it will be more leggy compared to others. The attractive flowers of Salvia officinalis are quite showy compared to other members of the mint family. Star Anise is our Spice Choice for June! In my volunteer job I have cataloged the plants of a very large property in the Victoria area. This entails comparing the on hand information with what I know and can find out from various reputable sources that are available to me. The plant collection was mostly planted nearly 100 years ago and this has lead me to become interested in other similar collections of the same age in the area. One such collection is very close to where I live and i was lucky to meet a lady who had done exactly the same job there. She briefly told me about the collection and then showed me a plant which does not grow anywhere else that she or I knew of. It was the Star Anise(Illicium vernum) the wonderful sweet licorice-like spice plant. The interesting Illicuim vernum flowers which are related to Magnolias. Here in the Victoria area Star Anise are absolutely at the coldest limits of where it can survive. Normally these plants grow into trees up to 5m (18ft) tall, yet here and in the in warmer areas of Great Britain it can only muster up a lumpy 3m (9-10ft) shrub form. This shrub is a common site in many areas of Asia including Vietnam north through China and Korea. It was imported into Japan by Buddhists and is often found growing beside temples and in grave sites. It is now grown in southeastern U.S.A. as a spice crop. Illicium vernum Also Known as Star Anise or Aniseed. Medicinally Star Anise has many useful properties. It has commonly been used as a carminative(reducing flatulence and other internal gases) , stimulant and as a stomachic which strengthens and tones the stomach. It is useful in promoting digestion and appetite which is not surprising as that is what the other ‘Anise’(Pimpinella anisum) is used for. It has also been used for colic in babies and a treatment for rheumatism. With it’s wonderful and strong flavor, it is often added to medicines to make them more palatable. Homeopaths make a weak infusion or prescribe a stronger tincture which is diluted in a liquid. This will be made using the crushed seeds. the bark is pounded and used to make fragrant insense. Star Anise Seeds are starting to develope from a recent bloom. To grow one of these interesting plants you will need to live in a warm climate to produce the best specimen. Zone 8 or above is a must to produce one a healthy Illicium vernum. It likes light sandy to medium loamy soil which is well drained. It grows best in a shaded position which is protected from cold winds to protect it’s glossy dark green evergreen leaves. As a shrub it has many uses such as in a shrub boarder or as a screen or fragrant hedge. it also works well as background shrub which can be used in a shady area. Star Anise with it's star-like seed capsules. The Latin name of ‘Star Anise‘ is Illicuim (meaning allurement) vernum (which refers to spring). As you can see the fruit capsules are formed into a star-like structure which is where the plant gets it’s name. There are even better examples that the above picture, maybe the cold effects the fruit structure. The flowers of Illicium vernum are very primitive. From Kim: Star Anise – June’s Herb of Choice! This month we’re featuring a great spice very well known in Asian cooking. I admit I am still a novice in Chinese, Thai, and Japanese cuisine but I do love to dabble with herbs and learn all I can. All over China, five spice powder (Mandarin wu xiang fen [五香粉], Cantonese ngh heung fan [五香粉], according to dubious sources also hung-liu) is known and valued. This spice mixture contains star anise, cassia (or cinnamon), cloves, fennel and Sichuan pepper usually to equal parts. Optionally, ginger, galanga, black cardamom or even liquorice may be added. These spices should be kept whole and powdered before usage. Five spice powder is often added to a batter made from egg white and cornstarch, which is used to coat meats and vegetables to keep them moisty and succulent during deep-frying. Meat is also frequently coated with a mixture of corn starch and five spice powder and deep-fried. Lastly, it is often contained in marinades for meat to be stir-fried. Since the mixture is very aromatic, it should be used with care. The subtle aroma of five spice powder is particularly effective in steamed foods. Steamed pork belly can indeed be a delicacy, even if it is, of course, never low in fat. For this recipe, the so-called five-flower cut is used that consists of three fatty and two lean layers. The meat is marinated in soy sauce and garlic, coated by a mixture of five-spice powder and ground, toasted rice and steamed until very tender (wu hua rou [五花肉]). This pork dish is very mild, but highly aromatic and pleasing. For more examples of star anise in Chinese cookery, see orange about the Sichuan-style beef stew au larm and cassia about master sauce. Outside China, star anise is less valued. In the North of Vietnam, it is popular for beef soups (see Vietnamese cinnamon). Star anise is also used in Thailand: In the North, it is often employed in long-simmered stews; elsewhere, especially in the tropical South, it is a common flavourant for ice tea. Thai iced tea (cha dam yen [ชาดำเย็น]) is brewed from black tea and flavoured with star anise powder, sometimes also cinnamon, licorice, vanilla and orange flowers; it is enjoyed with crushed ice, sugar and evaporated milk. To obtain a bright orange colour, azo dyes (typically, tartrazine) are usually added. So for my menu using this wonderful herb, I’ve chosen 2: Beef Noodle Soup – Taiwanese-Style and Red Cooked Beef! I think you’ll love using this herb and trying either dish. Plus soups just smells so good when cooking. When you purchase star anise, get the dark brown and not other anise powders which have a gray color. Transfer meat to a cutting board with tongs and discard bones and membranes, then cut meat across the grain into 1/2-inch-thick slices. Pour beef broth through a cheesecloth-lined sieve into a bowl and discard solids. Skim fat from cooking liquid and transfer liquid to a 3-quart saucepan. Add chicken broth and meat and reheat soup over moderately low heat. Meanwhile, cook noodles in a 6- to 8-quart pot of (unsalted) boiling water until tender, about 7 minutes (14 to 15 minutes for linguine). Drain noodles well in a colander and divide among 4 large soup bowls. Ladle broth over noodles and top with meat, scallion greens, bean sprouts, pickled mustard greens, cilantro sprigs, and red chile (if using). Note: Meat and beef broth can be cooked and strained three days ahead. Cool completely, uncovered, then chill meat in broth, covered. Skim fat before adding chicken broth. Next Up: Red Cooked Beef! Cut beef into 1 inch cubes and sear on all sides in hot oil in a heavy pot. Add all ingredients and bring to a boil. Cook covered on low heat about 2 hours or until meat is tender. This should reduce liquid to approximately 1/2 cup. If more than 1/2 cup liquid remains, uncover and increase temperature to boil liquid away to approximately 1/2 cups. Serves 6. Be sure the beef is fresh and has a good expiration date. I don’t like to buy any beef with less than 2 days expiration date. And boy when this dish is done the meat melts off the fork and is so flavorful! Try using star anise in your next meal if you haven’t tried it. I would always caution too that if you’re using a spice for the first time, try a little at first. You can always add more, but you can’t take out! ENJOY! Until next month….